Marks Barfield Architects have designed a 18-metre-high walkway through the canopies of sweet chestnut, lime and deciduous oak trees in Kew Royal Botanical Gardens in London. The 400-tonne steel structure was designed to blend in without harming its sensitive environment. The Xstrata Treetop Walkway at Kew Gardens opened on 24th May 2008, Kew Garden’s ‘Year of the Tree’, to over 9,000 visitors. The walkway takes visitors 18m high into the tree canopies for a birds-eye view of Kew, providing insights into the special role of trees in our breathing planet and the intimate views of a deciduous woodland and its inhabitants from within the tranquillity of the leaves. In conjunction with the Walkway, an underground ‘Rhizotron’ exhibition space is attached which explores various themes associated with tree root biology, climate change and the relationship between tree roots and microorganisms. Its appearance is inspired by a natural cracking within the earth to reveal a dark and dynamic space rich with exciting and educational content. Summary: Systems designers consider the context. Each subsystem is designed so it works synergistically with the others to form an optimized whole. In Ecological Systems Design, the "whole" is ultimately the whole planet. 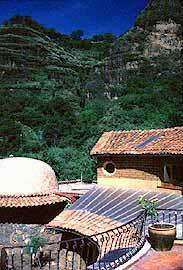 This home in the Huehuecoytl eco village (Eco village house) is made largely from natural materials, much of them from on-site. Harvested Rainwater supplies a cistern, which supplies super-efficient fixtures with water pre-heated by the sun, which drain through a greywater system, which waters fruit trees that shade the house in summer, reflect sun onto the house in winter, block cold wind, and supply fruit. Investment in these synergistically functioning systems saves resources and adverse impacts, making both the earth and the residence a nicer place to live. What ecological systems design is not: Specialists each solving their design problems by shifting impact from their specialty to someone else's. This is often the status quo. For example, residential recirculating water pumps save a little water by wasting a lot of copper and energy. Because we are a nation of specialists, individual systems are pretty well optimized. However, the opportunities to improve the way systems connect are rich and unexplored. I researched and developed the first laundry detergent which biodegrades into plant food. Apparently because plant physiologists, wastewater engineers and soap compounders have little professional contact, no one had thought of doing this before. This design opportunity fell through the cracks between their specialties. A systems approach is more involved. However, since in the real world everything really is connected, explicitly acknowledging these connections can only improve results. The reason this isn't done more is because hardly anyone is educated in this way.